It is “National Mushroom Month” so I couldn’t resist an excuse to promote one of my favorite of earth's creations: “the fun guys” aka mushrooms! 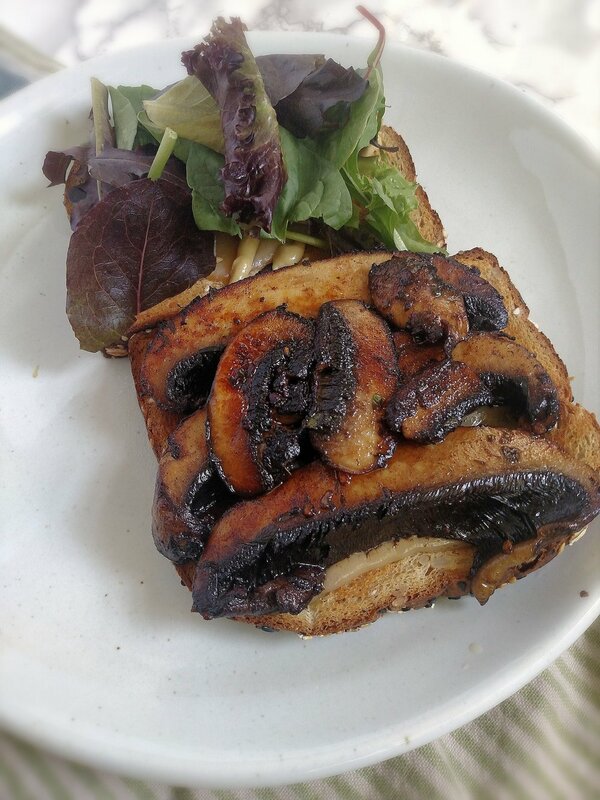 This portabella mushroom sandwich recipe is one that is dear to my heart because it reminds me of my teenage, vegetarian days. Do you ever eat something and immediately get nostalgia from the familiarity and comfort it provides? There are many dishes like that for me and this is one of them. It is a recipe that is simple enough that I have made it from memory over the years, no recipe card needed. Even though I eat meat now, this sandwich is something I still enjoy because it is SO satisfying and delicious that even my mushroom-hating, meat-loving husband tried a bite and said, “the flavor is good” (he has a texture issue with mushrooms...darn! More for me, right?). Portabella mushrooms are described as having a meaty like taste and texture. They are known as providing an “umami” taste – which is a Japanese word translated as “a pleasant savory taste.” Portabellas also offer many nutritional benefits, including being one of the few food sources of Vitamin D, which plays a role in maintaining healthy bones and hormones. One portabella mushroom provides nearly two-thirds of the recommended intake for Vitamin D. They also provide antioxidants such as selenium, which helps with immune system function. Portabellas can be cleaned by wiping with a damp paper towel or cloth. They are best used within 3-5 days of purchase and can be incorporated as a topping on burgers, diced up in an omelet, stuffed with cheese, or sautéed as a side dish (to name a few). On this sandwich, I included a little bit of smoked gouda cheese to help round out the flavors and provide a bit of protein and calcium. But really, I am a cheese lover at heart and find a way to add it to nearly everything. And how can you go wrong with smoke gouda? I also added some additional Dijon mustard to kick up the flavor as well as some lettuce for a nice crunch. You can use whatever bread you like. I chose a hearty, whole grain bread to help hold the juices and balance the soft, tender texture of the mushrooms. Are you a mushroom fan? How do you like to use portabellas? Check out the Mushroom Councils page for lots of great facts and tips on cooking with mushrooms: http://m.mushroominfo.com/fungi-facts-and-tips/. This recipe is not only quick and easy but is a great plant-based meal option for vegetarians and non-vegetarians alike! Whisk together olive oil, balsamic vinegar, garlic, Dijon mustard, and herbs in a shallow dish until well combined. Add sliced mushrooms to oil and vinegar mixture and toss/flip to coat evenly on all sides. Set aside. While mushrooms are marinating, heat a large non-stick skillet over medium high heat and pre-heat broiler in oven to "low" setting. Lightly toast bread in toaster. Add mushrooms to heated skillet and cook for 2-3 minutes, flip and cook additional 2-3 minutes, until browned and slightly softened on both sides. While mushrooms are cooking, add slices of gouda cheese to two slices of toasted bread and broil in oven for about 2-3 minutes, until cheese is melted. Remove from oven. Assemble sandwiches by layering cooked mushrooms over toasted cheese bread, adding lettuce and additional dijon mustard if desired. Serve immediately.